This post spoils some gameplay systems / moments in Fortune-499 and its general themes, but none of the specific plot events. 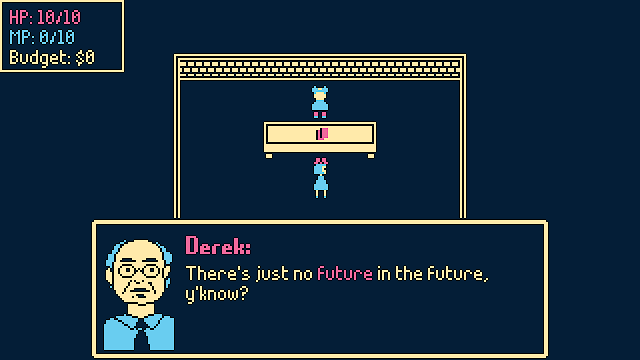 I just finished playing Fortune-499, a short stylish story RPG replete with millennial career angst and light deckbuilding. It does what other strong indie story RPGs like Undertale do: it actually questions the logic of its battle and progression systems, exploring its own design space for narrative effect. Few video games ever do this. Acclaimed AAA RPGs like Final Fantasy 12 ask you to fight many monsters and level-up via "license boards" or whatever, but rarely explore what those metaphors mean / interrogate the logic of these metaphors within the game world. Of course Final Fantasy 12 isn't alone on this, and AAA games don't usually care about this dissonance / disconnect, while most gamers probably don't even notice it anymore. However, I think Fortune-499 is one of those rare exquisite indie story RPGs that really does care enough to ask questions about its own game systems. In Fortune-499, you play as Cassandra, an everyday office witch who checks e-mail, complains about the printer, and banishes monsters for her company. To fight monsters, you play several rounds of rock paper scissors, but you can alter the AI's likely choice by drawing magical cards that affect probability. And just like any deckbuilding game, counting cards and re-ordering your deck is crucial for winning duels. But later in the game, you'll meet a character who ignores probability and plays artlessly, spamming offensive spells with all the MP he bought with his privilege. Worse yet, everyone thinks he's better than you! Thus, the game sets up this parallel between the tech industry and the magic industry: you can thoughtfully engineer number systems (your card deck) to solve problems, but social systems like sexism continue to undermine your career and give all the credit to male "wizards" instead of higher-skilled witches. The game continues its systemic critique through to the end, ultimately arguing that the RPG genre's singleminded focus on leveling up and completing dungeon-after-dungeon is not healthy. Quests symbolize work, and constant work takes a psychological toll on your character. If grind and dungeon-runs are also metaphors for work, then over-grinding would clearly lead to burnout. (puts on backwards baseball cap) Whoa, I guess the ultimate level-up is achieving a healthy work-life balance!! I also like what Fortune-499 does with its cards. When drawn out of your deck, most cards do something like "+4 chance of AI playing Rock", but later you get cards that give you additional health or mana, while some cards hurt you or change how the battle works. For one boss battle, you have to rig your own deck so that you draw the perfect tableau of cards to undo the boss shield; for another boss, you have to lose on-purpose and somehow rig the odds against yourself. 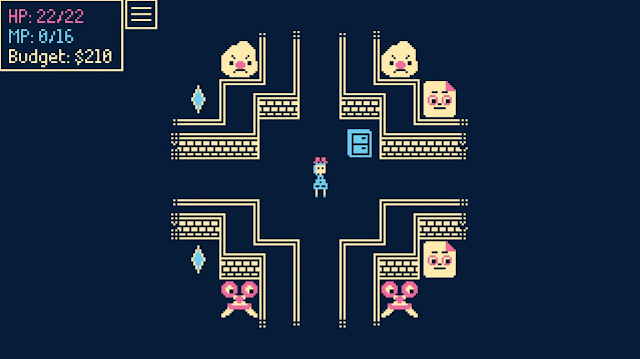 All these surprising systems variations and puzzle concepts usually tie heavily into the whole dungeon's theme. 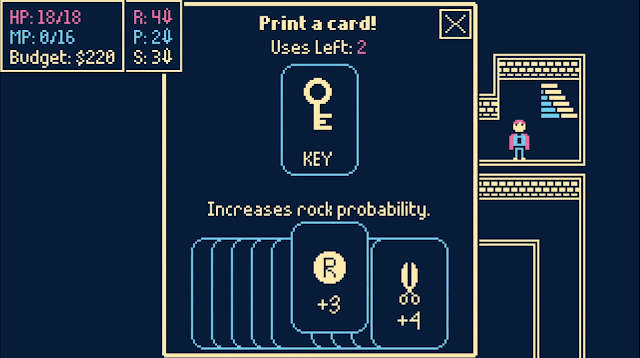 However, my favorite use of the cards is a fairly mundane case: in some dungeons there are locked doors, so you need keys to unlock these doors, and these keys are "key" cards! If the logic of this game world is cards, then it makes sense to represent other mechanics (and crucial plot points) using cards too. 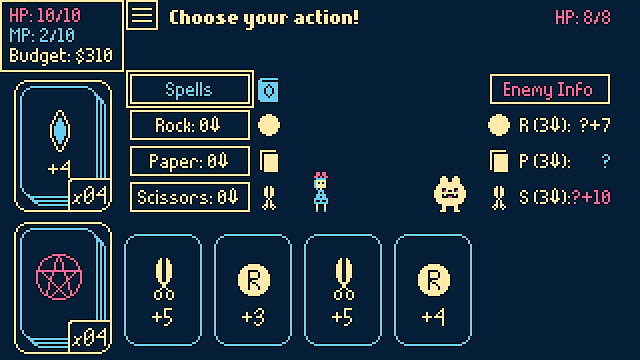 A lesser designer would've implemented a separate key inventory system, but Fortune-499 carefully slots these functions together. When you end up drawing these key cards during battle, they're useless in combat and you feel silly for stockpiling so many key cards into your deck -- but even then, there's an encounter when they're not so useless in battle anymore... and then that's it, the game doesn't make you fight 20 more battles with key cards. Thus, the game concisely explores the space around key cards without any repetitive gestures. There's not many "filler puzzles" or "filler encounters" here. Really, the only painful misstep of Fortune-499 is one level with a frustratingly cryptic "Lost Woods"-type of teleportation room maze puzzle. Up until then, the game does a good job of hinting what to do for its setpieces... then suddenly, this obtuse thing with little warning or explanation, oops. (HINT 1:) pay attention to the icons around each exit, what do they resemble? But anyway, Fortune-499 still has plenty of charm to compensate for that brief low point. 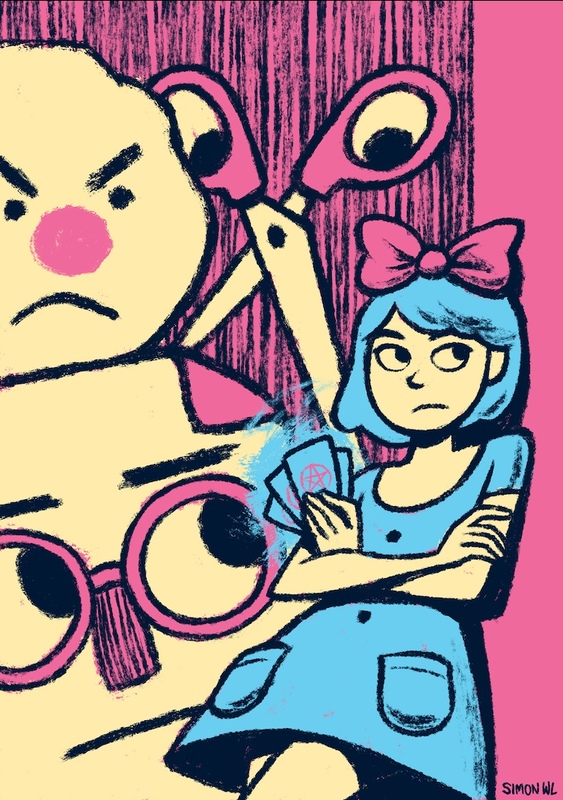 The CMYK color scheme and pixel art feels fresh and great, the music is pretty catchy, and anything that has the shameless audacity to mix Office Space and Kiki's Delivery Service together deserves special regard. This is an indie story RPG that is confident about its story, storytelling methods, world, and characters, all united with a very novel probability-based battle system. Across several different levels, it also maps out its own variation-space in a way that I usually associate with high-concept "pure" puzzle games like English Country Tune, A Good Snowman Is Hard To Build, Stephen's Sausage Roll, or The Witness. These games have Puzzles with a capital P, and I like them, but they always seem like hard mathematical proofs instead of soft metaphors for self-reflection. I argue that an "encounter" is something less rigid / formal than a puzzle. Games like Undertale, or Hylics, or the more obscure Winter Voices, use encounters to destabilize their own systems and assumptions. When you play a Final Fantasy game and level-up your endgame party into a giant ball of power and death, the game world never acknowledges that dynamic -- but the indie story RPG has the self-awareness to contextualize that progression and reflect it back at you. It's about what our many "encounters" mean to us, and understanding that encounter-space means we understand ourselves better. In that case, Fortune-499 might even be a bit ashamed about how many different encounters it has, but fortunately, it never ends up feeling like work. What is the game university for?